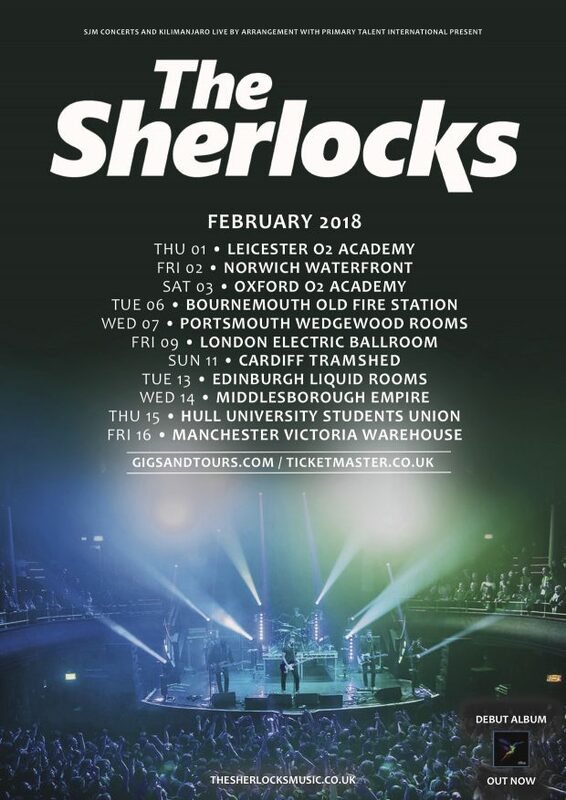 Following the recent success of their debut album, ‘Live For The Moment’, The Sherlocks have today announced their biggest UK headline tour to date in February 2018 (full dates below). The tour will go on general sale on Friday 6th October at 9am – tickets can be purchased here. The Sherlocks will also release single ‘Will You Be There?’ on 3rd November. Their debut album ‘Live For The Moment’ was released earlier this year to fantastic critical reviews and entered the official UK charts at #6, an outstanding achievement for a debut album and the biggest selling debut album for a band this year. To coincide with their album celebrations, The Sherlocks performed an energetic set the same weekend at Leeds & Reading festivals to thousands of fans and have just completed a sold out UK headline tour. The infectious ‘Will You Be There?’ is an indie dancefloor filler. With lively drumming, powerful guitar riffs and an instantly catchy chorus, singer Kiaran Crook confidently delivers relatable lyrics. Sheffield four-piece The Sherlocks have been relentlessly touring the and dates have included joining both Kings Of Leon & Richard Ashcroft as main support on their arena tours as well as numerous festival dates. The band, consisting of two sets of brothers, have been steadily building a solid live following and were the first unsigned band since Arctic Monkeys to sell out their local venue the Sheffield Leadmill. With support from the likes of Steve Lamacq, Annie Mac, Mistajam & Huw Stephens, this is a young band following in the great tradition of guitar groups from their area. The Sherlocks have drawn obvious comparisons from their influencers (The Jam, The Clash, Arctic Monkeys) but this is a band with unquenchable ambition intending to create their own unique sound and already captivating new audiences. The Sherlocks have been earning excellent live reviews up & down the country including a fantastic 4* review in The Guardian after their opening show in Newcastle on their September tour. After selling out multiple venues this year (including Sheffield’s Foundry, Manchester Academy and London’s Heaven) and wowing audiences with their live show, their fanbase is going from strength to strength. Visual Editor, Chief Photographer and original mind behind Soundcheck in it's original format. Eclectic music tastes and fan of a good beat. Can usually be found at a gig across the country or at a festival over the Summer - More than likely with a camera surgically attatched to me.